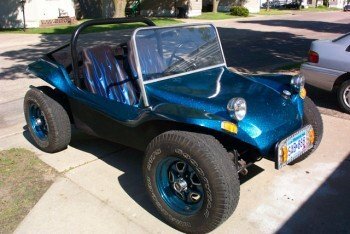 The cool Strato Flake Dune Buggy painted with 1 Jar of flake. Here is a pic from my vw buggy using your Strato Blue Flake. It is shot over a black base coat with 3 coats of clear mixed with strato blue and just one coat of plain clear over the rest. Thanks for a great product, Jay.